I experienced a couple firsts recently that you may not have expected from me, and they can both be summed up in two words: Old School RuneScape mobile. Why so unexpected? Well for one, you might not have expected me to try OSRS (can I call it that?) because I started playing RuneScape only recently; I had no nostalgic draw to the game back in that iteration. Two, I am not a mobile player. I just don’t play any games on mobile, preferring my gaming time to be at my PC. But hey, doing the unexpected can be fun, and I am all for new experiences! This experience included sitting down with Jagex’s Senior Communications Manager Jon Wilcox and Product Manager John Colgrave, who shared info and answered questions as we worked our way through the tutorial together. Now the question is, how was the experience? Would I continue to play on mobile even though the full cross-platform play allows me to move my game seamlessly back to the PC whenever I want? That’s what we are here to answer. 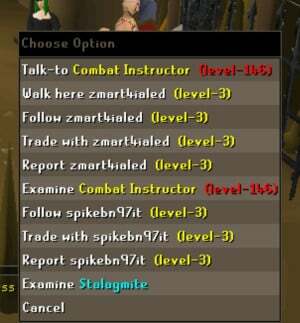 Old School RuneScape came about because there was a significant number of players who yearned for play of yore. They wanted that nostalgic experience and they requested it. Wilcox noted that 450,000 players expressed interest in returning to the game during a moment in the past, so a previous iteration was found and brought online. (The game has since morphed on its own, containing content that is not even in the current iteration of RuneScape, and all content is voted upon by the players.) But don’t think that because they loved playing in the past that these players are stuck there! No, they are right in the tech age with smartphones galore. And they are on the go. So naturally the best idea is to let the game go with them. So what do you get when you play Old School RuneScape on mobile? Not ads. The game is totally free, giving you the up to 30K hours’ worth of content (and growing). Colgrave said there are 138 quests in game, all with deep narratives. Of those, 20-30 are available to a brand-new account. Players will gain access to the others through progression, either by completing the earlier quests in a story line or through gaining a certain amount of skills of levels to meet the requirement to do them. Want more? You can subscribe and gain an additional 118 quests, 8 skills, and additional 20k hours of content. It’s the same sub as on the PC, which makes complete sense since the game moves seamlessly between the two platforms. If you’ve never played before, you’ll find basically the same tutorial that even the oldest vets have gone through; Colgrave said that the tutorial is pretty much unchanged for the last 15 years. The content is also exactly what you’d find on the PC. You’ll also be playing right alongside the PC players, unable to distinguish who plays where. The biggest change is in the UI. It was crafted to work with landscape play, putting the elements off to the side. The chat box is moved to the top to accommodate the keyboard. (Players might want to see what they are typing after all!) Colgrave also explained that menu options are more padded to prevent misclicks since fingertips do not have the same accuracy as a mouse pointer. New players will find the UI panels unlock as they go through tutorial. Players might notice a couple of other UI differences from the PC, such as using yellow and red dots to show you performed an action or walking somewhere instead of an X. You need to be able to see behind your finger! A small text pop up box will also tell you the action you can perform since you cant hover with a mouse. You can also set your game to different types of input, including keyboard or single tap. Although the game has moved to mobile, that doesn’t mean content will be delayed. Colgrave explained that Jagex will be maintaining the weekly release, which is a bit tricky when juggling two platform builds that must be reviewed and then deployed at right time. It is a challenge, but he said the team has done well so far. With 20 team members working on Old School now (up from three in the beginning), the team is up to challenges. The game will also maintain the up time that players are accustomed to, without lengthy downtimes interrupting gameplay. Right now, Old School RuneScape’s mobile platform is available as a members-only beta, but it will open up to all. Wilcox said it’s a big draw for bringing players back who previously didn’t have the time to dedicate at the PC, especially since you lose nothing from your account – you don’t have to start over again. All your friends, items, progress, everything is saved. “You pick up where you left off,” Wilcox said. Not all smart phones are created equal, so you might be wondering whether yours will actually see the final game. Colgrave said that the team was focused on making sure the mobile version is as accessible as possible, mirroring the accessibility of the original RuneScape that was accessible by just a browser if you had internet. Colgrave emphasized that the game was made to be available on the lowest possible devices. Right now the minimum it is playable on is Android 5.0 with 512MB RAM (hardware equating to a Samsung Galaxy 5) and around the iPhone 6 for Apple. Performance is acceptable on older phones, but Colgrave said on newer devices that Old School RuneScape sees “up to 60 frames per seconds, which is actually faster than what we have on desktop at the moment.” That gives the mobile very crisp visuals. Plus, whether or not you can play depends not just on hardware but on the data and battery usage. Colgrave explained that the mobile version uses only “a handful of megabytes per hour, max.” There is also an indicator included onscreen to let players know for sure if they are using cellular or WiFi. For mobile, devs also had to make it so that there are no significant interruptions for changes in IP as you travel. Obviously on the PC a changing IP would not be an issue. Colgrave said that players will experience maybe one second of unresponsiveness as the connections quickly changed instead of being booted back to login. As for battery usage, he indicated that the mobile would eat up about 10-20% per hour. The newer the phone, however, the longer it will last. Now, as for the topic of my experience. I started off with a moment of regret when I learned that this account was my permanent account that would go between the desktop and mobile. Why? Because I rushed through the character creation in order to meet the devs in game and play! I didn’t even choose red hair! Then I made the mistake of misclicking “experienced player” on startup as I entered beta. Gulp! Thank goodness it turns out that there is no gameplay difference in doing so — it is just an indicator Jagex uses to know how many players are brand-new player accounts and how many aren’t. Whew. Still, if my little fingers can misclick, I wonder how everyone else does. Before I even started the tutorial, I was impressed by the visuals on my Samsung Galaxy S. Perhaps because the game is 17 years old, I wasn’t expecting it to be so vibrant and crisp. The visuals definitely have their own style, but they looked good and defined instead of dull and dated. (The blown up screenshots don’t do it justice!) As I played, I found the movement and turning the camera to be easy and fairly intuitive. While many players might already know mobile controls well, as a primary PC player I don’t, so I appreciated not feeling lost as I tried to move around and play. As a new player, I also really did appreciate the tutorial unlocking the UI elements as we went and giving me the how-to. I do wish I could have minimized the tutorial chat box after getting my instruction as it was often covering the area I needed to go and no matter how I flipped my view it was often still out of reach in closed areas like caves. Even so, I went forth and cooked bread, mined and smelted metals, built fires, cooked shrimp, and fought critters. After sitting and playing at my desk, I needed to really test the game… by playing in bed! That is definitely not something I can do with most MMOs. And frankly, when there are times you are too ill to sit up for a laptop let alone get up to play on the desktop, having an option of something to play is great. The biggest problem I encountered was my arms getting tired of holding the phone up over my head. I also see the advantage to being able to do some skilling in fishing or whatnot when you are stuck waiting places like at the doctor office. I could say more about the game, but why not check it out for yourself? Keep an eye out for the beta opening up and give it a go. I plan on playing more, plodding my little newbie self along. Who knows, we might meet up at a fishing hole some day. I’m actually a little disappointed that it’s a cross-platform thing. I would have been more likely to play it if the mobile version was seperate, providing a fresh start for everyone, instead of throwing us with the veterans. RuneScape is very different from “standard” MMOs as the population is/always has been one super-ginormous server-independent single population. The massive size and diversity of the community and economy is actually a massive improvement over the WOW-style server-specific community/economy. Most importantly, someone having a higher level than you in something does not negatively impact you in any way. There is nothing gained with “firsts” in RuneScape, really (PvP is an obvious exception, but PvP fighting in the RuneScape “Wilderness” can entirely mitigate any level differences). In fact, it’s actually a huge benefit to be able to step into an already mature economy in RuneScape. Unlike other games, higher level players need massive quantities of lower-level resources that are not worth gathering themselves. As such, you can gather logs, ores, hides, fish and all sorts of other items and sell them to “wealthier”, longer-established players who will pay far more for the items than you might normally be able to acquire. Similarly, higher-level players can create/acquire things for lower level players that they can use that would normally be unavailable to only new players. Having the diversity of players in RuneScape also creates a huge need for community/ social interaction. Lower-level players can and DO help higher level players, and vice-versa. This is a dynamic in RuneScape whose like has no equivalent outside of, perhaps, Eve online. This interdependence between new and old players is an unquestionable benefit for building a community not seen in “standard” MMOs. Similarly, with RuneScape bonds you can acquire massive amounts of in-game “gold”/”coins” from established players with larger bank balances (for $6 or so) . Bonds would have been pointless on a newly-created empty server. I think if you get into RuneScape in any depth, you will soon learn just how awesome a large, interconnected and inter-dependent community of players can be, and how much of an improvement it is upon the WoW model of server-separated populations. I hate to say it, but your explanation is wasted on me. I played for a long time (though only in the old days and more recently RS3, never OSRS), and I disagree. RuneScape is highly dependent on crafting all kinds of things, and it just isn’t the same when the market is already flooded with 99% of craftable items. You basically have to get to super high level first before being able to create anything that potentially has actual value. For example, I remember that way back, it was a big deal to be able to craft mithril armor. You’d be able to sell this for nice prices on town squares. Nowadays, you go to the Grand Exchange, and the price is as low as possible, meaning equal to what you could gain from high alchemy. It’s this way for most stuff. Bottom prices because everything’s already on the market. A fresh start would have reset all this, and made even the lowest items useful for a while, thus creating an actual supply and demand economy, instead of the current one with an enormous amount of supply for most items with virtually no demand.